A court said that Pier 55, despite its name and locale, was mostly a park and a concert venue, and therefore its existence wasn't dependent on the river. Opponents, led by advocacy group the City Club of New York, found little public benefit in the project. The group asserted that the pier’s undulating topography, supported by distinctive mushroom-cloud piles, would block views across the river from Hudson River Park, stir up pollutants in the silt, and block sunlight from hitting the water, making it a threat to marine life in the Hudson River estuary. 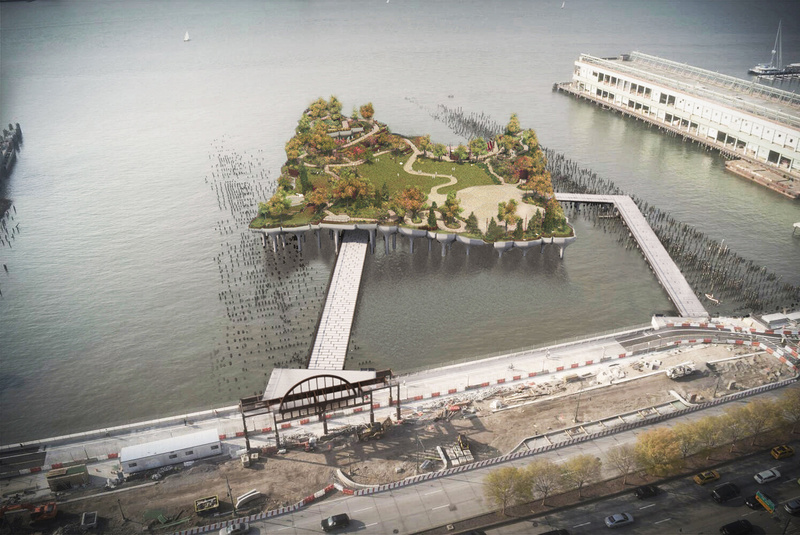 From certain angles, the pier could be much flatter than initial renderings suggest. The City Club brought multiple lawsuits against the Trust. In the latest, Judge Lorna G. Schofield of United States District Court said that Pier 55, despite its name and location, was mostly a park and a concert venue, and therefore wasn’t dependent on the Hudson River for its existence. Unlike kayakers who depend on a boat launch, or swimmers on the beach, concertgoers and joggers could just as easily listen to music or work up a sweat somewhere else. Schofield’s ruling, moreover, determined the pier would interfere with the Trust’s fundamental obligation to maintain the Hudson as a fish and wildlife refuge. To continue the project, the Trust could re-apply for a permit with the Army Corp of Engineers, but the ruling (below) would make it almost impossible to build out Heatherwick’s vision.